At a time when many funeral homes are owned and operated by impersonal corporations, Cortez Cremations & Funeral Services remains family owned and operated. We feel passionate knowing we can best serve our family as an independent company, allowing us and our staff to provide a personal one on one guide, paying extra attention to your family’s needs. Cortez Cremations & Funeral Services promises to guide families through the difficult task of planning final arrangements for loved ones. We promise to be there every step of the way, any way possible. Our professional and courteous staff will help answer all your questions, and present options that work best for you and your family before making a final decision. We take great pride of having the honor of knowing your loved one by their first name, not just a case number. Our family strives to make you and your family feel at home, knowing your loved one will be treated as family. 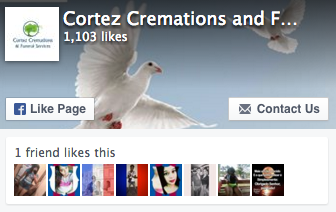 Cortez Cremations and Funeral Services is committed to upholding the highest ethical and professional standards, while keeping a warm family atmosphere. Known for integrity, professionalism and most important, compassionate as well as caring to you and your family. We desire to meet and surpass your expectations in making final arrangements for your loved one. Our many years of funeral experience shows our commitment to work hard to earn the trust of our community, continuously improve the personal and dedicated services, and carry on our long standing legacy. We offer traditional services in your place of worship, our chapel locations, nationwide as well as out of country transfers and veteran’s services. We strive to provide all services at competitive prices. We are proud to make special considerations for our Nation’s Veterans, Civil Servants, and Families of Hospice.